Terrence Malick’s latest game of twiddle sticks cinema peppers the landscape of celebrity ennui with vacuous narrative threads and listless visual poetry. A meandering, overlong death march towards nothingness, the latest from the American auteur is a showcase of a man who’s more than worn out his welcome, who has drip-dried every ounce of juice from the same re-wrung fruit but still yet splashed it up on the screen like a car wreck. 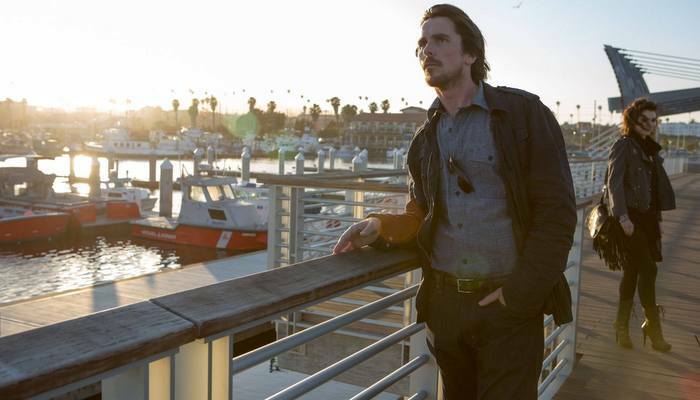 Anyone familiar with Malick’s filmography knows to expect little more of Knight of Cups than Christian Bale wandering the corridors of celebrity mansions, beautiful beach fronts and abandoned, dilapidated buildings while whispered trite reveries titter on in the background, theoretically contributing to a greater sense of purpose (that is just not there). In that regard, Malick has played to his devout audience bullheadedly, ignoring any and all critiques of his last critical flounder, To The Wonder, pursuing his own self-parodying style to pertinacious rigidity. Ruminations on the fleeting construct of family take precedence this time as Bale’s Rick makes his way through a host of beautiful women, each of which theoretically contribute to a character whom we know very little about. From what I’ve gathered, Rick is a wealthy dissatisfied actor, the top dog for comedy dreck, who himself is a bit of a sad clown character. Very little is revealed about Rick and that which is comes courtesy of voiceover narration from one tertiary character or another as they reflect on their experiences with him. The father. The brother. A friend. The ex-wife. The paramour. A fling. The mistress. Each straining chapter focuses on one element of Rick’s life, represented by the assorted collection of associates we meet and done up with a tarot card chapter title. But his interaction with each is equally drab and lacking in substance, offering very little specificity to distinguish how Rick acts from one moment, or individual, to the next. In each, he seems distracted, morose and uninteresting. The flesh-bound antithesis of the life of the party. Bale’s performance as Rick is consequently uninspired and resultantly flat but in his defense he has very little to work with. There’s no real aspiration towards character development present in Malick’s “script” nor does Rick ever manage to be much more than a dejected zombie, searching Malick’s hostile terrain for any remaining brains. Few are present. Cannon fodder comes in feminine form for Rick with Cate Blanchett and Frieda Pinto and Teresa Palmer and Imogen Poots and Natalie Portman all wandering onto and off the set in various degrees of undress. They’re notable performers who become invisible backdrops of sexuality; titillating pinups that probe the interworking of our uninteresting protagonist without finding themselves privy to characterization of any sort. As far as Malick’s film is concerned, the females pull the strings but are themselves but empty vessels. There’s much to Knight of Cups that pleads to be unpacked but even after opening the boxes and trying to configure them in various ways, I’m not convinced that there is anything present here besides substanceless drivel. Malick’s film, like many of his past, is created to be a tone poem, a feature to be experienced more through the senses than the intellect, one that begs for deeper reflection and requires its audience to bring into it a certain sense of their own consternation but all the banks in the world couldn’t lend Knight of Cups an inherent sense of completion. This complaint is made more egregious by the fact that Knight of Cups feels like a self-congratulatory brag-a-thon. Much like Rick, Malick rubs our noses in the lavish Hollywood parties and the saltwater of the California coast. He relishes his male gaze on a host of denuded models, pining for their moment in the sun. He struts past Antonio Banderas and Jason Clarke and Kevin Corrigan and Nick Kroll and Joe Lo Truglio and Joe Manganiello nined in bespoke suits, sopping up his compulsory dues from behind the camera. We see a filmmaker whose own self-importance has ballooned to the point of crippling irrelevance. Who cannot splice his own arrogance from his work. There’s a critique that ought to be evident in all of the carnal opulence on display – a critique experienced somewhat through Rick’s dizzying dourness as he masquerades unhappily through the scene – but the larger picture – that of a celebrity who’s become engulfed in his own sickening self-importance – escapes Malick in the most significant, reproachable of ways. CONCLUSION: A pretentious visual collage that panders to art-house patrons as much as it rejects traditional constructs of entertainment, ‘Knight of Cups’ is in desperate need of a plot and consequently becomes a litmus test of your patience. Within, Terrence Malick becomes almost self-parodying as he raises his signature directorial idiosyncrasies to virtually out-of-touch levels. This entry was posted in Out in Theaters and tagged Antonio Banderas, Cate Blanchet, Christian Bale, Frieda Pinto, Imogen Poots, Jason Clarke, Joe Lo Truglio, Joe Manganiello, Kevin Corrigan, Knight of Cups, Natalie Portman, Nick Kroll, Out in Theaters, Reviews, Teresa Palmer, Terrence Malick. Bookmark the permalink.